The small Lanini 1-25 is specifically designed to perform light farm tasks as well as lawn and landscape maintenance jobs. It is powered by a 3-cylinder, water-cooled diesel engine which delivers 22 hp and meets the Tier 3 emissions standards. This series is available with either a mechanical or hydrostatic transmission providing reliable performance in any situation. The 1-25M model with mechanical transmission features 3+1 gears and 2 ranges providing a total of 6FWD+2REV speeds. The 1-25H model has a hydrostatic transmission with two speed ranges designed to optimize the engine power, making this tractor perfect for gardening and municipal applications. Both models feature a mechanically-engaged 540-rpm rear PTO as standard. In addition, a 2000-rpm mid-PTO, which can also be used as a front PTO for operating a front-end loader, is available as an option. The hydraulic rear hitch with Cat.1 three-point linkage provides a lift capacity of 503 kg and features adjustable telescopic lower links to make attaching implements easier and faster. The hydraulics feature a pump with 29 l/min flowrate and is equipped as standard with a double-acting rear hydraulic valve. An additional hydraulic valve with joystick control is optionally available for front loader operation. The driving position, located on an iso-mounted platform, is equipped with a suspension seat and ergonomically-arranged controls for maximum operator comfort. From the smallest 1-25 to the largest 1-35, all models in this range are specially designed to perform light farm tasks as well as lawn and landscape maintenance jobs. They are powered by Tier 3-compliant, 3-cylinder, water-cooled diesel engines delivering 22, 28 and 34 hp, respectively. All three models are available with either a mechanical or hydrostatic transmission providing reliable performance in any situation. The mechanical transmission for the 1-25 model features 3+1 gears and 2 ranges for a total of 6 FWD+2 REV speeds. The mechanical transmission for the 1-30 and 1-35 models has 4 gears and 2 ranges giving operators the choice of 8 FWD+8 REV speeds with the synchro shuttle integrated into the steering column. 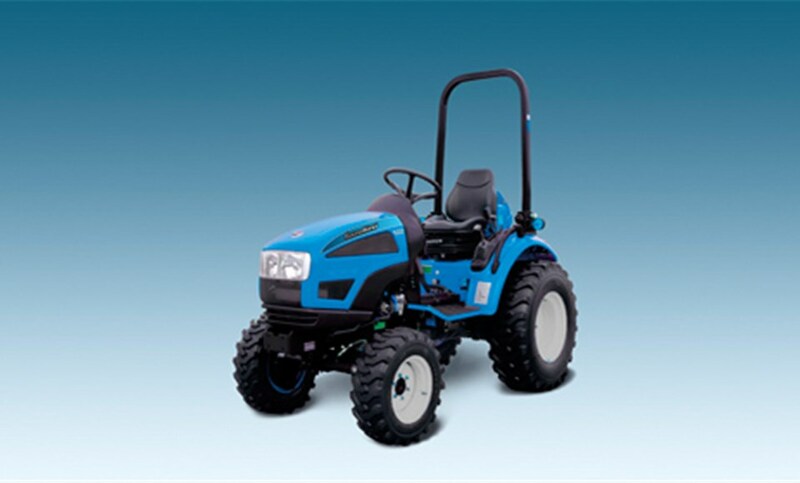 The hydrostatic transmission, providing two speed ranges for the 1-25H model and three speed ranges for the 1-30H and 1-35H models, is designed to optimize the engine power, making these tractors perfect for gardening and municipal applications. The 1-25 model features a 540-rpm rear PTO as standard. In addition, a 2000-rpm mid-mount PTO, which can also be used as a front PTO for operating with a front hitch, is available as an option. The 1-30 and 1-35 models offer a choice of either a 540-rpm or 1000-rpm rear PTO plus a mid-mounted PTO on request. The hydraulic rear hitch with Cat.1 three-point linkage is powerful and versatile and features adjustable telescopic lower links to make attaching implements easier and faster. The driving position, located on an iso-mounted platform, is equipped with a sprung seat and a fullyadjustable steering wheel for maximum operator comfort. The 1-40 and 1-50 series tractors designed to combine high performance, versatility and comfort in a compact footprint. They are powered by 41- and 49-hp, 4-cylinder, naturally aspirated diesel engines meeting the Tier 3 emission standards. Both models are available with either a mechanical or hydrostatic transmission providing reliable performance in any situation. The mechanical transmission with creeper and synchro shuttle provides 24 FWD+24 REV speeds. The synchro shuttle lever, integrated into the steering column, has a neutral feature for ease of operation between vineyard and orchard rows or inside greenhouses. The hydrostatic version features three speed ranges (high/medium/low) that optimizes the engine power, making these tractors perfect for gardening and municipal road cleaning. 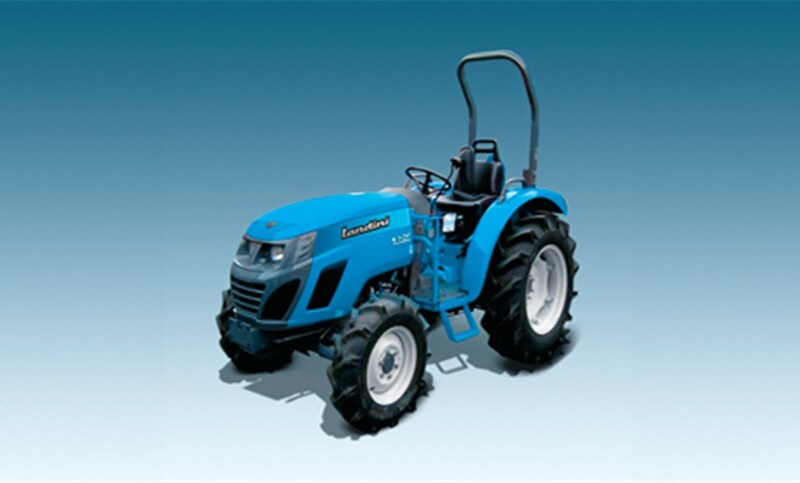 The tractor features as standard a 540-rpm rear PTO, electrohydraulically controlled by a pushbutton on the dashboard. The rear hitch also incorporates an auto PTO function which can be set to automatically engage and disengage the PTO drive, giving the operator precise control of the implement during headland operations. A 2000-rpm mid-PTO is also available as an option. The powerful and versatile hydraulic rear hitch can lift up to 1131 kg and features a Cat.1 three-point linkage with adjustable telescopic lower links and sway bars. The hydrostatic models are also available with cab. Cab features include heating and air-conditioning, ergonomically-arranged controls, a deluxe seat and four work lights for maximum operator comfort. The 1-50F series has been designed for use where space is at a premium, especially between orchards rows, where its tight turning radius allows for exceptional manoeuvrability. 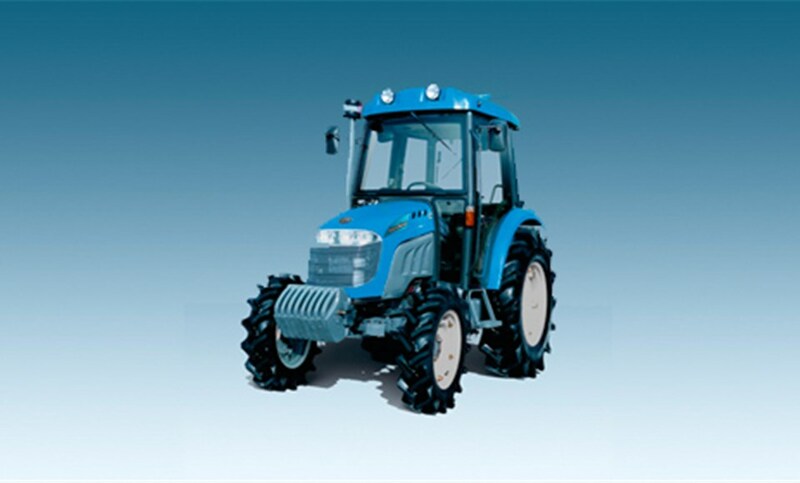 To assist tight turns, a pushbutton control allows the operator to increase the speed of the outer front wheel as the tractor turns, thereby reducing the turning radius for improved tractor productivity. The 1-50F tractor uses a 49-hp, 4-cylinder, naturallyaspirated engine that meets the Tier 3 emission standards, while delivering quiet operation and excellent fuel economy. This model features a mechanical transmission with creeper and synchro shuttle under the steering wheel that provides 4 gears and 3 ranges giving a total of 16 FWD+16 REV speeds. The hydraulic system delivers a maximum flow rate of 49,9 l/min and the Cat.1 three-point hitch lifts up to 1013 kg. The 1-50F comes as standard with two remote valves and can be optionally equipped with a joystick for the use of a front-end loader. The mechanically-operated rear PTO provides two speeds 540/1000 rpm. In addition, an auto PTO function allows the operator to automatically engage and disengage the PTO drive, when raising and lowering the implement, for improved headland management control. The iso-mounted platform with fully-adjustable sprung seat offers operators a comfortable driving position and the foldable ROPS allows the tractor to work with ease under low orchard and vineyard canopies and inside greenhouses. 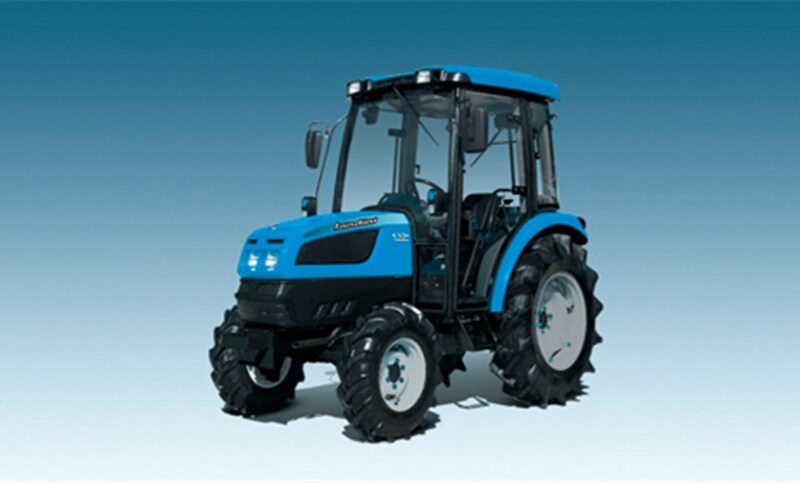 Available with either ROPS or cab, the 1-55 series tractor offers a comfortable and ergonomic driving position. The stylish, sloping engine hood design and the rounded fender shape make for outstanding all-round visibility and excellent manoeuvrability. The iso-mounted platform is large and roomy. The cab is fitted with heating, air-conditioning, radio, roof hatch and four work lights. A deluxe seat, along with the ergonomically-arranged controls, further enhances the operator comfort. The 1-55 model features a powerful, environmentallyfriendly 54-hp, 4-cylinder, turbocharged diesel engine that meets the Tier 3 emission standards while delivering quiet operation and outstanding fuel efficiency. The mechanical transmission with synchro shuttle features 4 gears and 3 ranges delivering a total of 12 FWD+12 REV speeds. The rear PTO is electrohydraulically operated by a pushbutton on the dashboard and provides two speeds 540/1000 rpm. A hydraulic control system allows the operator to adjust the raising and lowering speed, as well as the lift travel of the rear hitch. The Cat. 2 three-point linkage has a maximum capacity of 1204 kg. This tractor model can be equipped with a front-end loader controlled by joystick (optional).